Give potatoes a little more oomph with this small-batch mix of spice blends. Can You Do The Mashed Potato? The humble spud may be bland on its own, but should you choose to see the plain-clothes potato as a blank canvas, you'll be surprised at how this veggie can be transformed into a culinary masterpiece. Julie Pedersen gives the modest root vegetable the respect it deserves with her small-batch spice blends that take the easy-to-prep potato from side dish to center of attention. Her blends feature spices with worldly flair, making the most of the simple spud, no matter which way you prefer to enjoy it: mashed, baked, sauteed, or (French) fried. Made in Montreal, Canada. Check out our Gift Lab to see how the Potato Seasoning Set treats your tuber! Cute idea. Flimsy tin packaging. This product is a cute idea, and a perfect Yankee Swap present for my potato-loving family. I was disappointed that the tin seems to have been damaged in the shipping. It looks a bit worse for the wear even after I have tried to bend in back into shape, and it won't remain closed. Most of the seasonings are only half full. I bought this for a gift as I had received it a year ago for Christmas and all the tins were filled to the top. I've bought this as a gift several times and it's always a big hit. 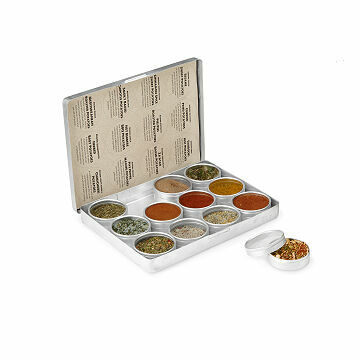 Sharing food and spices is always a great idea! I love putting it potatoes,soy curls and so much more.It is that versatile and the flavors are so unique and I love them all! Very useful to introduce new flavors to people at small dinner parties , children. I wanted to give my friend's sister a wedding gift and this was perfect. It wasn't so pricey that it would make her feel uncomfortable, and yet it was an appropriate gift for a couple starting their life together. Turned us from potato junkie to potato gormet. I purchased this gift for my son and his wife. They are both very conscientious of what they put in their body but still want food to taste good. Since sweet potatoes and potates in general are their go to carb, this was a perfect fit. They love it! The blends are all very different and add so much excitement to their food! Thanks for offering such unique gifts... Will be back at Christmas for all the other foodies on my list.